A new tool from online retailer Amazon could vastly improve the flexibility of virtually staging a home on-the-spot to entice potential buyers. The latest version of the free Amazon app for iOS (iPhones and iPads) uses augmented reality (AR) technology to give Amazon customers the chance to virtually place items inside their home before committing to a purchase. It will allow them to get a fairly good sense of the size, color, and aesthetic, as well as how the object fits with their decor. The product presents some potential opportunities for real estate agents. Imagine showing a home to a potential client who wants to know how a king-size bed would look in a home’s master bedroom, but the current homeowner only has a full size. Instead of pulling out the tape measurer and asking those clients to close their eyes and use their imagination, with a few clicks and swipes, the client can actually visualize how it will look. Agents and professional stagers could also envision how certain set pieces would look before loading up a truck and hauling them into an open house. The technology utilizes Apple’s ARKit technology, a free package of software coding tools that lets independent app developers (those outside of Apple), create AR experiences. AR is a loose term that refers to when digital objects appear as though they are occupying the same physical space as you. 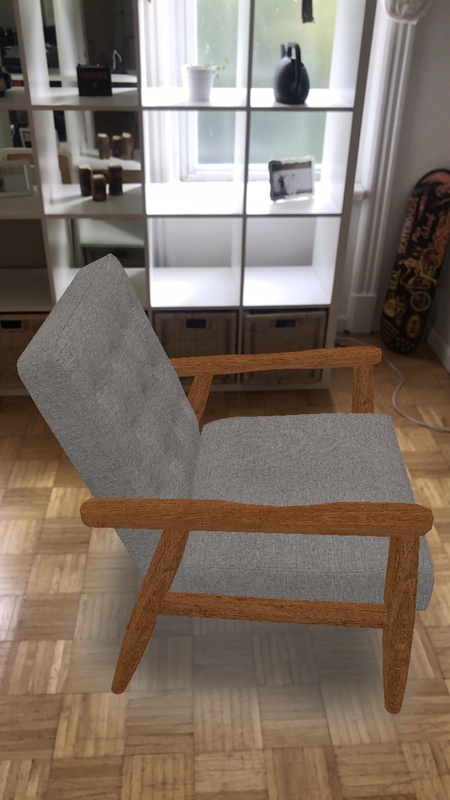 In the case of ARKit, this is accomplished by using an iPhone or iPad’s camera. Ikea, Wayfair and Target all currently utilize the technology for a similar function; however, as one of the nation’s leading online retailers, it’s very likely that Amazon’s app will further push the tech into the mainstream. It’s hard to visualize a product and its dimensions when you’re viewing a flat picture online, and Amazon shoppers have few brick-and-mortar options for perusing the retail giant’s vast inventory. To take advantage of the new feature, customers need to download or install the latest version of the Amazon app from the Apple Store, click on the camera icon on the top right and choose “AR view.” From there, users can select from thousands of items — an array of home decor, electronics and appliances for the living, bedroom, kitchen or home office. The app will allow users to rotate the items and get a full 360-degree look in live camera view. Coming on the heels of Amazon Key, a smart lock service that allows delivery people and other guests (such as homebuyers) to unlock homes by invitation with an app, AR view is the company’s latest attempt to move from your doorstep to the inside of your home. Will Amazon Key change the way real estate agents show homes?